“Advancing access to insurance” is a Corporate Responsibility Topic we newly established in 2016. While many of our innovative solutions target underinsured communities and risks (see examples in Strengthening risk resilience), it is a fact that 60% of the world’s population remain excluded from appropriate insurance products. This is why we seek to advance public awareness of the societal value of insurance and the role insurance plays in achieving sustainable economic development. 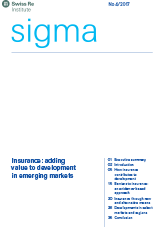 In 2017, an issue of our sigma publication series (4/2017) took a detailed look at “Insurance: adding value to development in emerging markets”. The publication first presents the empirical evidence on the positive link between insurance and economic development and then describes the existing barriers for insurance solutions, emphasising that emerging markets are heterogeneous and present different supply- and demand-side barriers. The publication argues that a better understanding of these barriers is key to developing effective new approaches. In particular, greater availability of data about insureds makes it easier to recognise their actual behaviour and needs. In combination with innovation, technological progress and new approaches, such as microinsurance schemes and public-private partnerships, this enables the creation of products suitable to local conditions. Selected case studies from around the world illustrate how insurers, policymakers etc. can work together to achieve this.